Great day visiting the city of the Immaculate Conception built by St. Maximilian Kolbe which at one time before World War II was the largest monastery in the world with 760 Franciscans and published a newspaper which used 1,200 tons of paper a year. It strengthened the Polish people to withstand the onslaught of the Nazis and then the Communist Soviets. Today we joined 1,000’s of the heroic and devout Poles celebrating Mass on the Feast of the Assumption and Soldiers Day here in Warsaw. The afternoon was spent touring Old Warsaw and the history of this marvelous country. I tried to capture it all for you in these two videos (plus Deacon Dominic’s excellent homily). 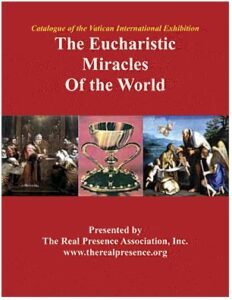 Interesting site with articles on the Eucharist and the Real Presence, a catalog of Eucharistic miracles and more. It is a wealth of information — especially as we approach Corpus Christi Sunday. I knew nothing of this as a Protestant and find it absolutely intriguing now. I am so glad to be a Catholic and to understand the Eucharist and the Holy Sacrifice of the Mass! Referring to Eucharistic Miracles, Janet and I have been to Orvieto and Lanciano in Italy. Incredible!